Brú na Bóinne (the Boyne Palace) in County Meath contains some of the most important historic sites and monuments in Ireland, and is a designated World Heritage Site. It features the massive megalithic ancient passage tombs – which are graves dating back to ancient times – of Newgrange, Knowth and Dowth. These tombs are older than both Stonehenge in England and the Pyramids of Giza in Egypt. Newgrange, which was built about 5,000 years ago, is Ireland’s most famous prehistoric site. It is especially famous for a spectacular event on Dec. 21, also known as the Winter Solstice, the shortest day of the year. The tomb was built in such a way that on this day, it is illuminated by a narrow beam of sunlight, which shines through a specially designed roof box. Those who have seen this say it is an unforgettable experience. Nobody knows why the tomb was built in the way it was, or indeed how the stones were even transported to the site. However, it does seem certain that Newgrange was built before the invention of the wheel. The tomb itself was almost lost to history itself. It was sunk into the ground for over 4,000 years, only rediscovered in 1699 when workers carried away building stones for the landowner. As they removed the stones, they discovered the entrance. However, they left it undisturbed as they thought it was a cave. Then, in 1962, archaeologists began to investigate the sinking mound. 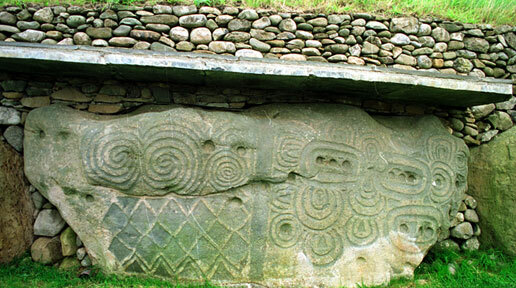 Newgrange was then excavated and restored to its former glory. Today, access to Newgrange, Knowth, and Dowth begins at a visitor center, from where you can take a guided tour of the site. The Hill of Tara is also in Co. Meath. An archaeological complex, it consists of a number of ancient monuments, including the Stone of Destiny, the Fort of the Kings and the Mound of the Hostages. Located on the River Boyne, it is said to be the actual seat of the High Kings of Ireland. Nearby is the site of the Battle of The Boyne, one of the key dates in Irish history, in which protestant William of Orange defeated Catholic James II in 1690. For many people around the world, the Ring of Kerry drive encapsulates their image of Ireland: ancient monuments, romantic castles, spectacular gardens and colourful towns and villages. The stunning scenery, dramatic coastline, charming locales, and ancient archaeological treasures have been featured in postcards, film, poetry, and song. Here, the idealized view of Ireland as a land of rural greenery and natural beauty springs to reality. Tourists come to Kerry to experience this rare dip into a lifestyle foreign in pace, philosophy, and spirit. Each twist and turn on a drive around the Ring of Kerry reveals new sights – windswept cliffs, breathtaking scenery, spectacular lakes, rich flora and fauna, green and yellow chequered hills and unspoilt beaches. 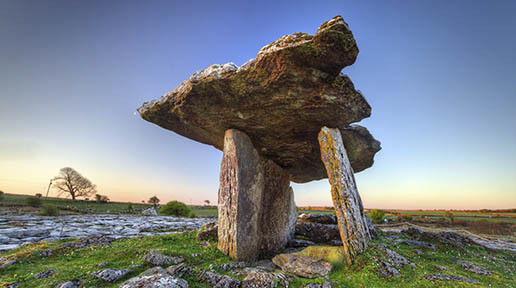 There is evidence of the region’s unique heritage and culture everywhere, in the place names, the standing stones and the many archaeological sites. The 6th century beehive huts and ruined monastery on Skellig Michael are a UNESCO World Heritage Site. 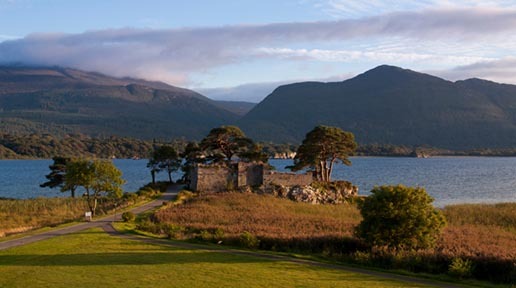 Also worth checking out are the stone forts at Caherciveen and Castlecove, the Neolithic stone circle in Kenmare, the 15th century Ballycarberry Castle, the magnificent O’Connell Memorial Church, Derrynane House and Gardens or the pretty 19th century Heritage town, Kenmare. The area is a favourite among artists, writers and sculptors, and there are a number of craft shops and galleries such as Cill Rialaig showcasing their best works. It is also ideal for activity holidays, such as walking and cycling routes, diving and angling and adventures sports, to its array of championship golf courses – Waterville (An Coireán), Dooks, Kenmare and Killorglin. The coastal roads provide an ever-changing landscape around the Iveragh Peninsula, with snapshots of the famous offshore islands popping in and out of view around every corner. The most famous and breathtaking part of Ireland’s craggy west coastline is the Cliffs of Moher area, which feature some of the most breathtaking views on the entire island. The Cliffs stretch for almost 5 miles and rise up to 702 feet over the waters of the Atlantic Ocean. 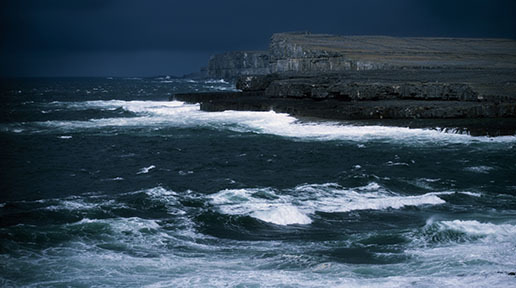 The amazing view from the Cliffs includes the Aran Islands, Galway Bay, The Twelve Pins and the Maum Turk Mountains. 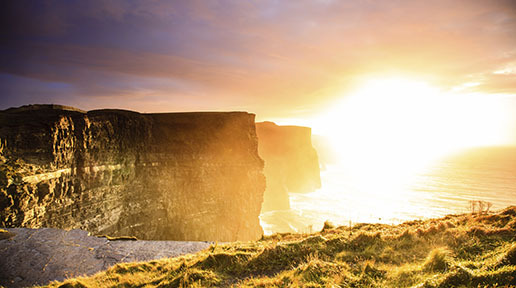 The landscape and seascape of the Cliffs of Moher have, for centuries, welcomed a multitude of visitors; close to 1 million people per year now travel to this iconic location. But don’t get the wrong impression – just because many people flock to the site, this in no way spoils the experience of being there; it’s easy to forget your surroundings and lose yourself in nature as you stand near the edge of the majestic cliffs. A trip to Galway would be incomplete without a visit to the Aran Islands, the collective name for the small islands, Inishmór, Inishmaan and Inisheer. The mystical, frozen-in-time islands are famous for their preservation of a rural existence largely unchanged, at least culturally, over the centuries. There may be some electricity there these days, but the ways of the past are carefully preserved among locals who make their living much the same way their ancestors did. The residents of the islands are happy to accommodate guests, whether by raising a pint in friendship or unravelling the folklore of the enchanted isles. Elizabeth Zellinger, a Swiss citizen, moved to Inishmór, the largest island of the three, in 1974 and grew to love it so much that in 1996 she founded Celtic Spirit (www.irish-culture.ch), an organization that runs cultural vacation experiences on the island every summer. Groups of eight to 14 people shuttle back and forth to classes and workshops held at the Creig-an-Chéirín Center in Inishmór, overlooking the sea and the mountains of Connemara. The program is a great way to explore and learn about this fascinating island group. If you would rather explore Inishmór on your own, rent a bike and make a loop around the entire island. On your one-day cycling tour, you will encounter ancient ruins, lots of livestock and even miniature houses for leprechauns (or are they for the tourists?). A trip to Dublin’s most popular tourist attraction is compulsory for any self-respecting tourist in Ireland’s capital. The Guinness Storehouse tells the story of how Guinness is made and how this famous drink came to be one of Ireland’s best-known exports. It is in an awesome building: its core is in the shape of a giant pint glass, and consists of seven floors. After walking around for about 45 minutes and being constantly told how wonderful Guinness is, soon the subliminal messages start to kick in. The top floor, which has the Gravity Bar, is the most fun. 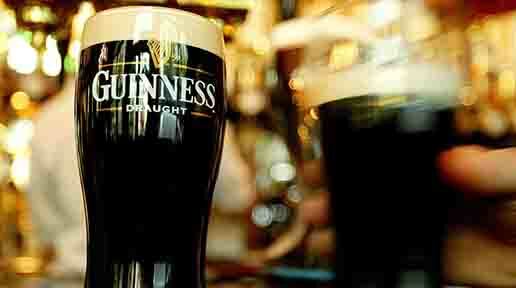 There you get a complimentary pint of Guinness. You also get the most spectacular view of Dublin, which is worth the admission price alone. 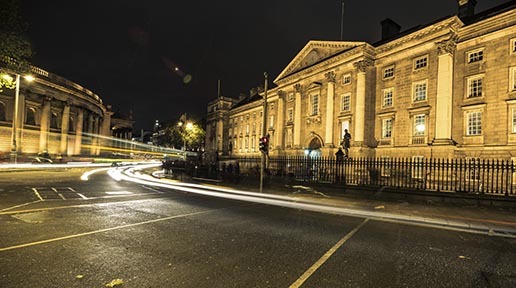 Trinity College is Ireland’s most prestigious college – and although its rivals at University College Dublin might dispute this, it is probably the best university in Ireland. However, one thing not up for argument is the magnificent setting of Trinity: many of its majestic buildings are hundreds of years old. (The college was founded by England’s Queen Elizabeth 1 in 1592.) Architecturally at least, Trinity is way above its nearest rivals. It is also worth taking one of the guided tours around the college, as nearly every building seems to have an interesting story. Many of the tour guides appear to be Trinity College drama school graduates: They always seem to add a little dramatic flair to their tours. The best time of the year to visit this university is around the end of May, just after the students’ exams are over. Then the whole college comes to life. A popular activity among its students is to sit out outside the Pavilion Bar (known as “The Pav”), while watching a game of cricket. Join them and bring a few beers, if you get the chance. The Burren, which is formed by limestone karst plates (in other words, it is a great big rocky mass) is one of Ireland’s most famous natural attractions. The limestone terrain holds a special fascination for geologists and botanists for its Mediterranean and alpine plants. Described as a botanist’s paradise, the Burren has one of the most diverse and beautiful floras in Ireland: 635 different plant species (including 22 of Ireland’s 27 native orchids) have been recorded here. The region also has a number of more rare and elusive species such as the carnivorous pine marten, the snake-like slow worm and the rare lesser horseshoe bat, as well as over 100 breeding birds and almost all of Ireland’s native butterfly species. The diversity of species is due to a happy coincidence of natural and cultural factors. As well as the unique growing environment provided by the thick limestone and thin soil, low impact traditional farming practices such as the ancient practice of winter grazing contribute to the presence of this rich flora. The European Union has designated most of the Burren as a Special Area of Conservation, a title reserved for the finest natural environments in Europe. 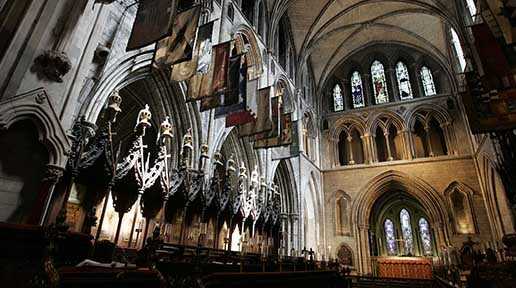 St. Patrick’s Cathedral, Ireland’s largest church is also one of the biggest tourist attractions in Dublin. In a well close to the cathedral, St Patrick was believed to have baptized converts from paganism to Christianity. To commemorate his visit, a small wooden church was built on the site. Later, in 1191, the present building was constructed, and St. Patrick’s was raised to the status of a cathedral. St Patrick’s is also notable for being the first place where Handel’s “Messiah” was performed, in 1742. Another interesting fact: Jonathan Swift, the author of “Gulliver’s Travels,” who was the dean of the cathedral from 1713-45, is buried here. While this cathedral is replete with history, St. Patrick’s is not, however, a museum. It is still very much a living building with services held every day of the year. There are also sung services six days a week. The choir sings two services every day during school terms – the only cathedral in Ireland or Britain to do so. 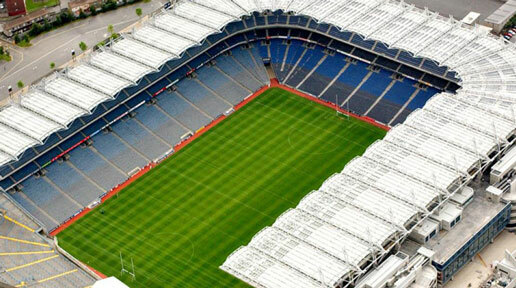 Croke Park is the stadium where Ireland’s two national sports, hurling and Gaelic football, are played. It is also the headquarters of the Gaelic Athletic Association (GAA), the sporting body responsible for these national games. It is hard to believe that Croke Park is primarily designed for amateur sports – with a capacity of around 80,000, it is the fourth largest stadium in Europe. However, it is much more than merely a stadium: it has been described as the spiritual home of Irish cultural nationalism. Hurlers and Gaelic footballers – and indeed their fans – speak of Croke Park as if it were sacred ground. “Croker” is something of a hidden secret for tourists. If you can get tickets, the chances are that you will be one of the few tourists there. The best time to get tickets is usually around May at the start of the season. To go and see a game of either hurling or football at Croke Park is to sample a unique slice of Irish life. While you are there, visit the GAA museum and go on a tour of the grand stadium.